The antioxidant phytonutrients in blueberries are called anthocyanidins. Anthocyanidins have the ability to neutralize free radical damage to the collagen matrix of cells and tissues that can lead to cataracts, glaucoma, varicose veins, hemorrhoids, peptic ulcers, heart disease and cancer. They also directly cross-link with collagen fibers to form a more stable collagen matrix. The cholesterol fighting effect of cholesterol is due to the actions of the phytosterol, pterostilbene. Pterostilbene binds to the PPAR-alpha (peroxisome proliferator activated) receptor. This receptor is important in reducing the number of cholesterol and other types of lipids in the bloodstream. According to a study conducted at the University of Guelph in Ontario, the mechanism by which blueberries help protect the brain and central nervous system is by causing an increase in serum antioxidant status, which is linked to reduced risk of chronic and degenerative diseases (Kay CD et al. The effect of wild blueberry (Vaccinium angustifolium) consumption on postprandial serum antioxidant status in human subjects. Br J Nutr. 88, 4:389-98, 2002). Blueberries appear to promote neurogenesis (the growth of neurons). This is apparently due to the anthocyanin dyes which give blueberry their color. These dyes are able to cross the blood-brain barrier and trigger nuerogenesis. Blueberries have the effect of relaxing blood vessels, preventing increased blood pressure and all of the problems that go with that condition. 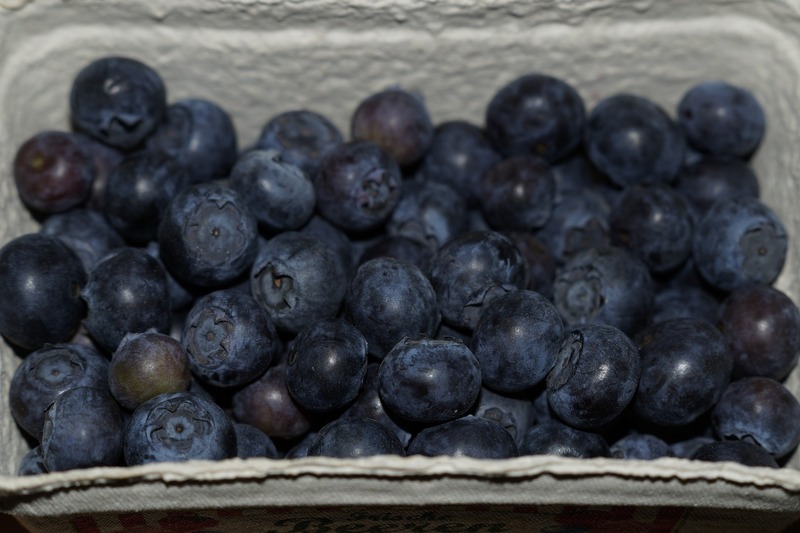 What accounts for the amazing cognitive benefits of the blueberry? “What blueberries do is what simply can be called strengthening the brain by taking advantages of the brain’s tremendous redundancy,” says James Joseph, lead researcher at the U.S.
Blueberries also keep cell membranes healthy, allowing for more efficient transportation of nutrients around the body. Blueberries contain small amounts of chemicals known as tannins. In large amounts, tannins have been associated with liver and kidney damage. Consumption of high tannin supplements can also lead to esophageal or mouth cancer. Blueberry may interfere with the effectiveness of insulin, oral drugs for diabetes, and herbal products that affect blood sugar levels. It may also block the absorption of drugs and nutrients. Bilberry, the European cousin of Blueberry, may interfere with the effectiveness of insulin, oral drugs for diabetes, and herbal products that affect blood sugar levels. It may also block the absorption of drugs and nutrients. Bilberry may also increase the risk of bleeding when taken with drugs that increase the risk of bleeding. Some examples include aspirin, anticoagulants (“blood thinners”) such as warfarin (Coumadin®) or heparin, anti-platelet drugs such as clopidogrel (Plavix®), and non-steroidal anti-inflammatory drugs such as ibuprofen (Motrin®, Advil®) or naproxen (Naprosyn®, Aleve®). There are currently no scientific recommendations as to the amount of blueberry to consume to achieve positive health benefits. Blueberries can be purchased in capsule form or extracts, teas, or in their natural state. If using the capsule form, follow the dosage advice on the container. The best method for preservation of blueberries is drying. Place the blueberries in a food dehydrator, on a screen in a gas oven and use the pilot light only for drying, hang them with a needle and thread, or spread them on screens in the shade. For bilberry leaf tea, soak about 2 teaspoons of the chopped dried leaf in about 5 ounces of boiling water for about 10 minutes, strain out the solid particles, and drink the tea. add 1 tsp. dried or 3 tsp. fresh berries or leaves. Bring to just below boiling point and simmer for 10-20 min. To make a tincture, place leaves or berries in an airtight non clear container. Cover with alcohol of at least 90 proof (vodka). Cover and place the bottle in a dark cool place. Shake 2-3 times each day. Amber bottles are preferred. Ready for use 2 wks. Keeps indefinitely. Add to warm or cold water or place on a sugar cube to administer. Dosage is 10-30 drops per dose. Repeat 8-10 hrs later. A 2005 study conducted by the National Institute of Aging (NIA) examined the effects of blueberry polyphenols on lifespan and aging of the nematode, Caenorhabditis elegans (C. elegans, a microscopic roundworm). A mixture of blueberry polyphenols increased lifespan and slowed aging-related declines in C. elegans. The blueberry extract consists of three major fractions that all contain antioxidant activity. However, only one fraction, enriched in proanthocyanidin compounds, increased C. elegans lifespan and thermotolerance (Wilson, et al. Blueberry polyphenols increase lifespan and thermotolerance in Caenorhabditis elegans. Aging Cell. 2006 Feb;5(1):59-68). A 1999 USDA study showed that a diet rich in blueberry extract reversed some loss of balance and coordination and improved short term memory in aged rats. This was the first study to actually demonstrate a reversal in dysfunctions of behavior, going farther than earlier studies that linked high-antioxidant fruits and vegetables to prevention of function loss only (Journal of Neuroscience, September 15, 1999). A 2003 Tufts study showed blueberries enhanced memory-associated neuronal signaling and alterations involved in certain neuronal activities and concluded it may be possible to overcome genetic predisposition to Alzheimer’s Disease through diet (Joseph JA et al. Blueberry supplementation enhances signaling and prevents behavioral deficits in an Alzheimer disease model. Nutr Neurosci. J6, 3:153-62, 2003). Tufts scientists, who have been in the forefront of blueberry research, reported another study in the August 2005 issue of Neurobiology of Aging demonstrating results that suggested that the age-related changes in temporal processing speed in the primary auditory cortex may be reversed by dietary supplementation of blueberry phyto-chemicals (Galli RL, Bielinske DF, Szpringiel A, Shukitt-Hale B, Joseph Ja. HSP70 neuroprotection. Neurobiol Aging. 2005 Apr. 30). A 2005 study to investigate blueberry’s ability to ameliorate age-related deficits in neuronal and behavioral functions, examined whether short-term supplementation with blueberries might enhance the brain’s ability to generate a heat shock protein 70 (HSP70) mediated neuroprotective response to stress. Hippocampal (HC) regions from young and old rats fed either a control or a supplemented diet for 10 weeks were subjected to an in vitro inflammatory challenge (LPS) and then examined for levels of HSP70 at various times post LPS (30, 90, and 240 min). While baseline levels of HSP70 did not differ among the various groups compared to young control diet rats, increases in HSP70 protein levels in response to an in vitro LPS challenge were significantly less in old as compared to young control diet rats at the 30, 90, and 240 min time points. However, it appeared that the blueberry diet completely restored the HSP70 response to LPS in the old rats at the 90 and 240 min times. This suggests that a short-term blueberry intervention may result in improved HSP70-mediated protection against a number of neurodegenerative processes in the brain (Neurobiol Aging. 2005 Apr 30). Blueberry can act as a diuretic and can affect iron absorption. Blueberries contain small amounts of tannin. Consumption of high tannin supplements can lead to esophageal or mouth cancer. The blueberry is the fruit of a shrub native to North America. Much research has shown that blueberries provide health benefits in the areas of anti-aging, antioxidant action, disease prevention, treatment of urinary tract infection, improving eyesight and controlling cholesterol. Does the blueberry have anti-Cancer properties? What is the best form of blueberry to take? If possible, it is best to consume blueberries in their natural state. The constituent parts of the fruit work synergistically to provide maximum benefit. At this stage, there is no scientific evidence that freezing blueberries reduces their beneficial health effects. Can blueberries help me to fight cholesterol? Yes. A compound in blueberries called pterostilbene is an effective activator of peroxisome proliferators-activated receptor alpha isoform (PPAR-alpha – a cell receptor involved in the absorption of compounds into cells for use in energy production). Rooibos Tea – The Healthy Drink. Cranberries – Simple Protection from Cancer and Heart Disease. The Medicinal Power of Black Cohosh! VERNA Champion on Rooibos Tea – The Healthy Drink.